Performance, safety and efficiency refined. Tomkart is designed to be the safest, most durable and efficient go-kart on the market. With state of the art software integration, it is the best solution for rental go-kart track. Thanks to adjustable pedals and seat it is suitable for body sizes from 125-195 cm. Tomkart is available in 10 basic colors. You can combine them to your preference or ask for custom color scheme or promotional print. For the best racing experience we introduce smart speed settings. Every driver starts as a beginner with basic speed. As he improves his lap times, system is giving him higher speed level, which is than saved in his profile. This feature makes Tomkart safe and enjoyable for all ages and driving skills. Tomkart features integrated sector control setting, which ensures maximum safety on the track and efficiency of track management. Maximum speed in sectors can be set up to your preference and track character. How smart speed levels works? Speed setting for each level, lap times and turbo boost usage fully customizable to your preference and character of your track. Important information and settings directly on the steering wheel to ensure maximal racing experience and safety. Driver can see his live results and safety instructions on the display during the race. Driving time up to 30 min. 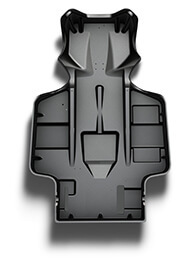 Our monoblock carbon fibre chassis is elastic but stays inherently stable. A steel pipe chassis however will deform irreversible after usage. The elastic tomkart carbon chassis always comes back to its original form. Combined with plastic all-around protection and rubber buffers provides high level of safety and low maintenance. Brushless electric motor in combination with lithium batteries and custom BMS ensures the maximum performance at any time. With our recommended settings for rental tracks the Tomkart reaches up to 65 km/h. A top speed of more than 100 km/h is possible with the max. constant power output of 10 kW / 13.5 hp. The peak power of the engine is 17 kW / 23 HP. F1 design with carbon fibre elements makes Tomkart very customer attractive. Designed and developed with Swiss quality approach. More than 8 years of prototyping and testing in our own go-kart tracks Kartbahn Spreitenbach and Tempodrom Winterthur. Up to 10 000 charging cycles thanks to our battery management system. A Tomkart needs, in full rental use, about 1 Ah current per minute. With full batteries it is possible to drive about 30 minutes. We recommend a driving time of 8 minutes to not overtrain the customers. The charging time of the batteries is about 50% shorter than the driving time since charging can be done with higher intensity of current than driving needs.When the battery needs charging the system notifies the race manager, to do so. It also notifies the race manager how many rides are left for each go-kart. So it provides the best efficiency of charging cycles. LiFePo Batteries (50V/40 Ah/30kg) - maximal output power 10kW/maximal input power 6kW - up to 10 000 charging cycles thanks to our battery management system. 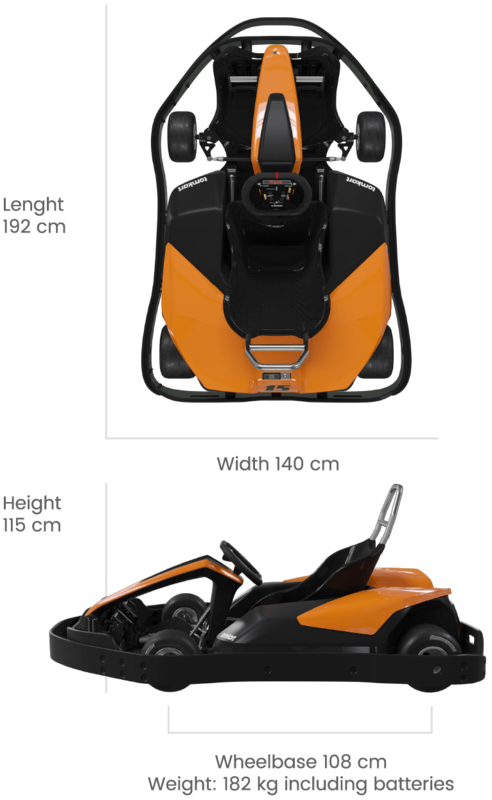 Depends on various influencing factors such like the type of battery-charger or the characteristics of the kart track as well as the average driving time. 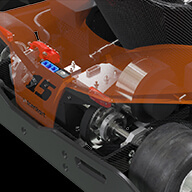 On our rental kart tracks the batteries have a lifetime of up to 10’000 charging cycles. Thanks to the intelligent battery management system and in compliance with the operating instructions we are able to give a pro rate guarantee of 5’000 nominal-cycles (10 Ah/8-10 minutes driving time).